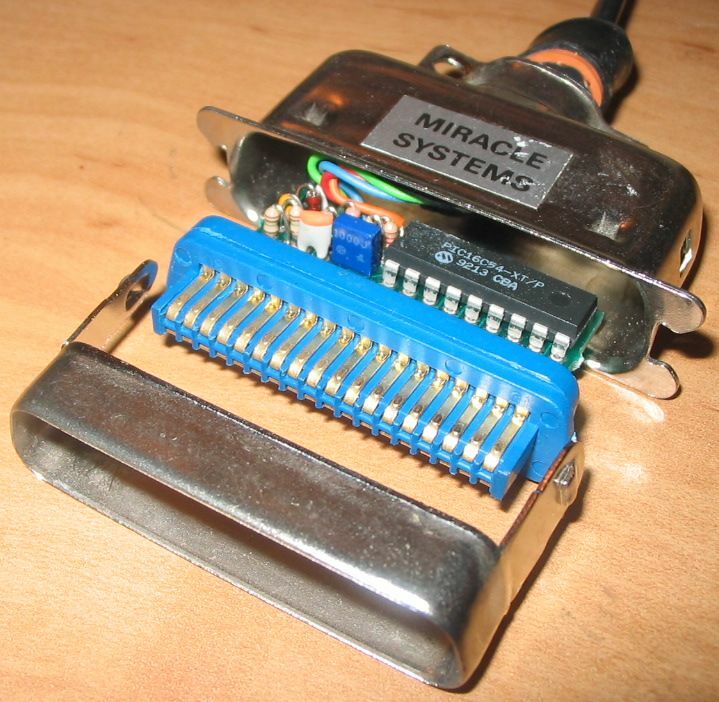 Two very common connectors used in the eighties were the Centronics parallel port (particularly used for printers) and the RS-232 serial port (particularly used for mice and modems). Suppose you have a computer with one kind of port and a peripheral with another (particularly, a computer that talks RS-232 and a printer that talks Centronics). Is/was it possible to buy or build a widget to translate between them? (A widget simpler than a full-blown computer, I mean.) It seems to me that the parallel to serial translation would need some kind of shift register. I'm not so sure about the voltage issue. As I understand it, Centronics uses 5V and RS-232 uses 12V. Is there a way to translate between those? Unlike more modern UARTs the 6402 does not have any internal registers that need to be 'programmed' to set it up, so it can be used standalone - and it has separate parallel read and write ports which are easier to use in a 'dumb' hardwired circuit. I built a circuit similar to this in the early 1980's, but today I would probably use a small microcontroller board such as the Arduino Pro Mini (clones of which sell on eBay for ~$2 each). Yes, there were such gadgets that converted serial to parallel. The attached picture shows a Miracle Serial to parallel converter for the Sinclair QL, courtesy of 1984. 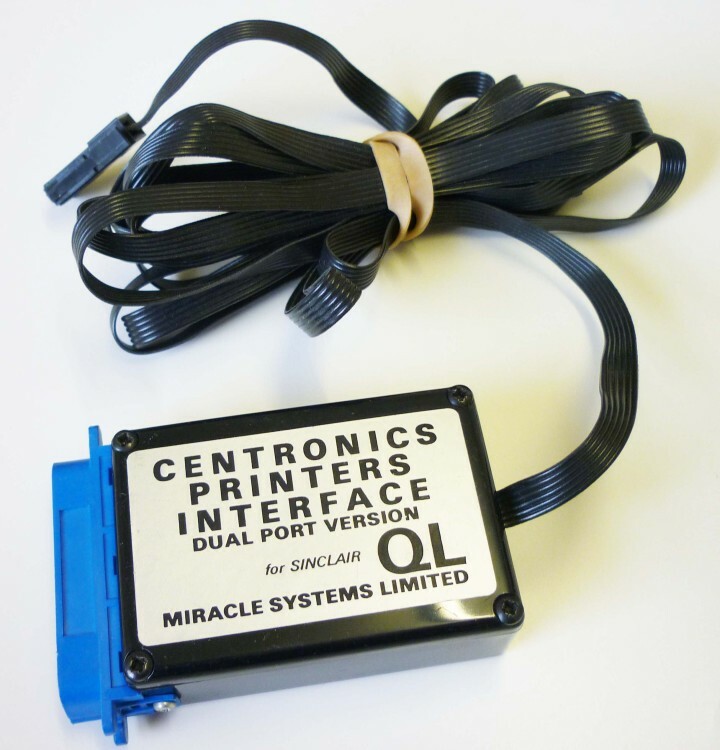 The QL had no ex-factory Centronics printer interface, and solutions that blocked the expansion port for connecting a printer only were not really what customers wanted, so the Centronics Interface was a cash-cow for Miracle Systems for years. This is only barely Retrocomputing. Almost all the printers I use today (and most people I know) are connected USB or networked. But ports for PCs are still available and as noted below, the companies I dealt with years ago for converters still sell them. But there aren't so many printers these days with serial or parallel ports now that 100M (or even 1G) network ports for printers are dirt cheap, so we'll call it Retro. For example, Okidata Microline printers would typically come standard with a parallel port but you could add a serial port card (I probably still have one around here somewhere). In more recent years I think they even had a network card that used the same interface slot, though I never bothered with that myself. With PC-compatibles this is trivial, but with other machines not always so easy. Plus there are situations (e.g., 6 terminals plus 2 printers all connected serial to an 8-port statistical multiplexer over a modem connection back to the host) where this is just simply not an option. Plus end-to-end serial has big advantages over parallel - 200 feet without any problem at all. These have been available for a long time from Patton (sells nationwide but one of my favorites because they are nearby), B & B and Black Box - all of which still list parallel/serial converters on their web sites. Voltage is, I think, the least of the conversion issues. The big factor is handshaking. Over the years, I found that parallel handshaking was very reliable but serial...not so much. It seems that some manufacturers just never got serial handshaking to work well, and I sometimes had to resort to large buffers (typically a little box with a Z80 (or similar), 64k of RAM and ports for in & out) to work around the problem. But I think the basic converters typically did their job without a full CPU - just a bunch of glue chips/logic to read a byte in one form and send it out as another. Not the answer you're looking for? Browse other questions tagged hardware rs232 or ask your own question.